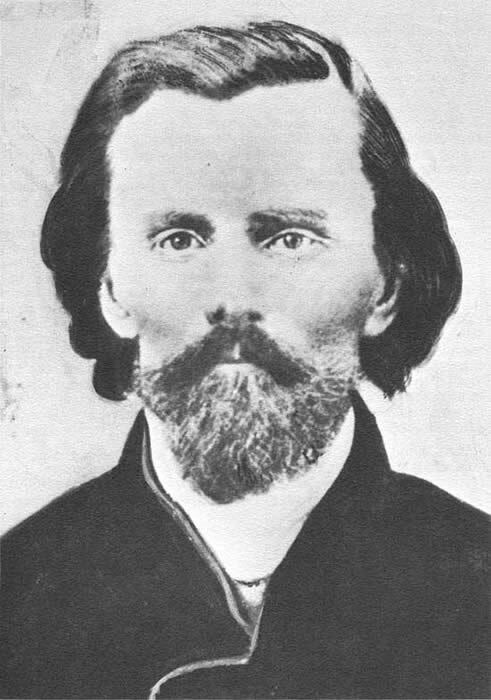 Jedediah Strong Smith was probably the first American to visit the Four Creeks area. Searching for a mythical river that supposedly flowed from the Rocky Mountains to the Pacific Ocean, he went south from Great Salt Lake, picked up the old Spanish Trail to the Colorado River, and, after crossing the Mojave Desert, eventually reached Mission San Gabriel late in 1826. Smith and his party were well treated by the Spanish but were regarded with suspicion and, in January 1827, were ordered to leave California by the same route by which they arrived. However, the party turned north from San Bernardino, crossed Cajón Pass into the desert, then over the Tehachapis into the San Joaquin Valley, probably by way of the old Garcés route. They traveled up the east side of the valley, trapping beaver on the Kern, Tule, Kaweah, and Kings Rivers as they went. Smith later reported this to be the best beaver country he had ever seen. Thomas L. "Peg-Leg" Smith, called El Cojo (the crippled one) by the Spanish, was another early visitor to the valley. He came in about 1830 and gained a reputation as a horse thief. He is believed to have encouraged thievery among the Indians. 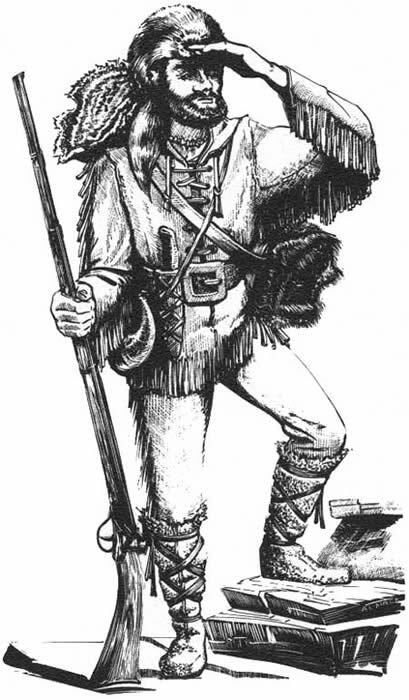 Hudson's Bay Company trappers were active in the region in the early 1830's and Ewing Young, with Kit Carson as a member of his group, encountered them as competitors as his party trapped throughout the valley in 1832. John C. Fremont, with Kit Carson as guide, passed through the Four Creeks area on his second expedition. After an arduous winter crossing of the Sierras, he traveled south from Sutter's Fort on March 24, 1844. On April 9, he camped in the Four Creeks area, probably on the banks of the Kaweah. Fremont referred to the Wukchumni as the "Horse-thief Indians" and was very careful in guarding his horses at night. Lieutenant Derby pointed out that this location would be central to the passes to the west, to Tejón Pass, Walker Pass, and directly on the road from the mines to the south. Just who may have been the first white settler in the Kaweah River area is somewhat open to question, but it is certain that no attempt at settlement was made before 1850. Generally, the first attempt at settlement is credited to John Wood who came to California early in 1850 in the John Hudgins party. Wood left the party in Los Angeles and went on to the northern mines. What he did during the next few months is not known, but in the fall of 1850 Wood led a party of 14 or 15 men into the Four Creeks area from Mariposa. They settled between the Kaweah and St. Johns Rivers, east of present-day Visalia, built a cabin of oak logs, and began to prepare the land for cultivation. Wood chose a poor time to attempt colonization, for the Indians throughout the valley had become alarmed at the encroachment of white settlers on their land. Despite attempts at pacification by James D. Savage, the foremost trader in the area, the Indians served notice that failure to heed the warning to leave their lands would result in violence. Francisco, an old mission Indian and leader of the Kaweah Tribe, ordered Wood to leave and gave him 10 days in which to do so. Whether Wood chose to ignore the warning, or was preparing to leave when the Indians attacked is not known, but when they attacked at the end of the 10-day warning period (December 13) the settlers were caught in the open rounding up cattle and most of them were easily slain. Wood and a teen-age youngster, Frank Boden, managed to get to the cabin, and the boy, although hit four times with arrows, hid in the willows along the stream and eventually escaped. Wood holed up in the cabin and defended himself there until his ammunition was exhausted. Finally, the Indians broke through the roof to descend on Wood and kill him. As was their custom, they took a square of skin from Wood's back and nailed it on a nearby oak tree as a warning to future settlers. Another account of Wood's death was that he was skinned alive by the Indians, and after his skin was removed he rose to his feet and walked about 100 feet, falling on his face to die at the edge of the river. The primitive Indian tribes of the Tulare Lake Basin knew so little of the arts of warfare that they did not even have a word for it in their language. Intertribal battles were not unknown to the Yokuts, but on the few occasions when they did occur, they were carefully pre-arranged by messengers, rarely resulted in more than two or three fatalities, and frequently ended by feasting with the winning side as the host. The Indians had received their first indoctrination into the white man's version of warfare from the Spanish who completely decimated the villages on the west side of the valley. The east side Indians, more numerous and better led, were not so easily subdued and held off the Spanish more successfully. As the American incursion took shape, dissatisfaction with the way they had been displaced, abused, bilked, and worked long hours at low pay in the mines around Mariposa had put the Indians of that area in a warlike mood. This dissension spread to the Kaweah Indians who traditionally occupied the area into which John Wood moved. The Wood massacre was not an isolated incident but part of a general, but unsuccessful, plan of the Indians to chase the Americans out of their lands. Following the Wood massacre, soldiers were dispatched from Mariposa and arrived with materials to build a fort. Further Indian troubles at Mariposa made their services necessary there and, after burying the remains of the Wood party, the troops left the Four Creeks area without punishing the Indians, who were seen driving a large herd of cattle into the mountains. The first citizens of the infant community of Visalia built a stout stockade against the Indians, but despite many alarms there was never any significant trouble with the Indians there. With advancing civilization, minor conflicts sporadically occurred, but it was an unjust night attack on an Indian rancheria in 1853 or 1854 that seemed to lead to ultimate general conflict. Efforts were made by a Government agent to bring about a peaceful settlement but the Indians, now gathering numerical strength, refused to believe him to be the spokesman for the majority of Americans. In the fall of 1855, an Indian boy's body was found on the Kaweah River, supposedly killed by settlers. A short time later a number of cattle were shot full of arrows and the settlers warned the Indians that any recurrence would result in the hanging of those responsible. Within a short time another settler reported the loss of cattle and the settlers took Francisco prisoner, forcing him to yield two Indian youths believed guilty of cattle shooting. One of the Indian boys was subsequently shot and the other allowed to go free. Finally, the report of stolen cattle in what is now Frazier Valley set troops in motion and, in a combined civilian-military attack on an Indian redoubt on Battle Mountain, led to dispersal of the Indians into the mountains. A series of subsequent murders caused a general roundup of Indians and their confinement on a reservation on Tule River. Following the Wood massacre, civilization rapidly advanced in the Four Creeks area. By 1857, Visalia was a thriving community and during that year construction of the first school, the first county courthouse, and the first jail was begun. 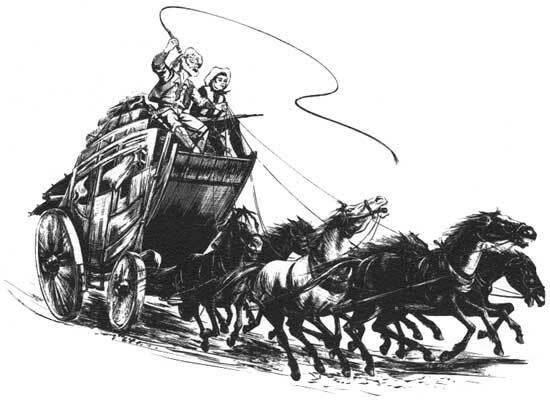 In 1858, Visalia was a stop on the Butterfield Overland Mail route from the end of the railroad west of St. Louis to San Francisco. Although there are many interesting legends of lost Spanish mines in the Kaweah River area, the actual yield of minerals was never of great importance. The Spanish prospected for gold in the area before American settlement and it is documented that one gold mining expedition disappeared into the area and was never heard from again. Lieutenant Derby found an ancient windlass and other evidence of mining in the area a few miles northeast of the present Terminus Dam, and there is a legend among descendants of Wukchumni and Padwisha Indians that a great battle took place between a Spanish mining expedition and the Indians on the North Fork of Kaweah River in an area now inside Sequoia National Park. The legend says that this battle took place about 1811 and resulted in a total victory for the Indians. Visalia served as an important way point for travel to the mines in Kern, Inyo, and Mono counties, and many miners who became disappointed in their search for gold returned to the Four Creeks area to farm or raise stock, thus laying the foundation for an economy based upon the true wealth of the region. The land that was to eventually become Terminus Reservoir gradually developed into an agricultural area devoted essentially to livestock ranching, irrigated and dry farming, and citrus fruit growing. A branch line of the Visalia Electric Railroad was built to Terminus to serve the ranchers and fruit growers. Limestone was extracted from a deposit at Lime Kiln Hill, which now serves as the south abutment of Terminus Dam, and used in many parts of the valley during the 70-year period following its discovery in 1859. The first settler in the Terminus Reservoir area, and the first American to see what is now Sequoia National Park, was Hale D. Tharp, a Michigan cattleman who had successfully mined gold near Placerville, El Dorado County. He came into the Four Creeks area in 1856 in search of a place to settle his family. On the way to California he had married a widow who had several children. Tharp settled at the confluence of Horse Creek and Kaweah River and built a crude log cabin on the west side of Horse Creek a few hundred yards upstream from the river. Figure 21: Hale Dixon Tharp Fresno Bee photo. Tharp got along admirably with the Indians, expressing a respect for them in all he said and did. He killed deer for them and otherwise befriended them. In reciprocation, they shared their knowledge of the country. They told him of the high mountains where there were trees so large it took 25 men clasping hands to encircle them, and of lush mountain meadows that were green all summer. I first located at my ranch where I now live in the summer of 1856. There were about 2,000 Indians then living along the Kaweah River above... Lemon Cove.... The Indian Chief was named Chappo,  and he was a fine man. The Indians told me that I was the first white man that had ever come to their country [and] few of them had ever seen a white man prior to my arrival. The Indians all liked me because I was good to them. I shot many deer for them to eat as they had no firearms. I liked the Indians, too, for they were honest and kind to each other. I never knew of a murder or theft amongst them. There was [an] abundance of game and other animals in this country when I first came here. Deer were practically everywhere with lots of bears along the rivers; occasionally a grizzly bear, too. Lions, wolves, and foxes were very plentiful. There were a great many ground squirrels, cottontail, and jack rabbits; quail were seen in covies of thousands. There were plenty of fish in the rivers below the rapids, lake trout and suckers and [sometimes] a speckled trout could be caught. Accompanied by two Indians, I made my first trip into Giant Forest during the summer of 1858. We went in by way of the Middle Fork... and Moro Rock and camped a few days at Log Meadow, after which we came out by same route that we went in. I do not remember the dates that we were there, but I carved with my knife on [a large fire-hollowed] redwood log my name and the date on the same day that we got there. These figures and my name should still show. When we arrived at Log Meadow, there were a great many deer and a few bears in the meadow which paid little attention to us other than through curiosity. The deer came up all around our camp and looked at us, and some of the bears sat upright in order to get a good look at us. I shot a small buck for camp meat [and the] shot did not seem to frighten the other deer or any of the bears. I had two objects in making this trip; one was for the purpose of locating a high summer range for my stock, and the other was due to the fact that stories the Indians had told me of the big trees caused me to wonder, so I decided to go and see. Tharp returned to the high mountain area again in 1860 and, in 1861, because a few white men had come into the area in which his homestead was located, he decided to occupy the Giant Forest range in order to hold it. From 1861 to 1890, when Sequoia National Park was created, Tharp held the area as his summer range and he or some member of his family went there every year with stock. The burned out log became his summer home. Copyright © 2006-09 Claud "Sonny" Rouch, all rights reserved. Website by OACYS Technology. Cover photo by Roberts Engineering.